The House of Blues became the House of Mars last night when 30 SECONDS TO MARS and MIDDLE CLASS RUT came in for the first of two shows here in Dallas. The place was packed to the rafters with fans of all ages who were more than ready for the antics the bands were sure to bring. MIDDLE CLASS RUT started things off as the only opener and the two piece band did a great job. It seemed to take a little time to get the crowd going but a couple of comments about how we were all sinners for being out on Sunday got everyone fired up. Though the sound seemed a bit off and for me at least the vocals were a bit hard to understand the band did a great job and had the audience singing along. 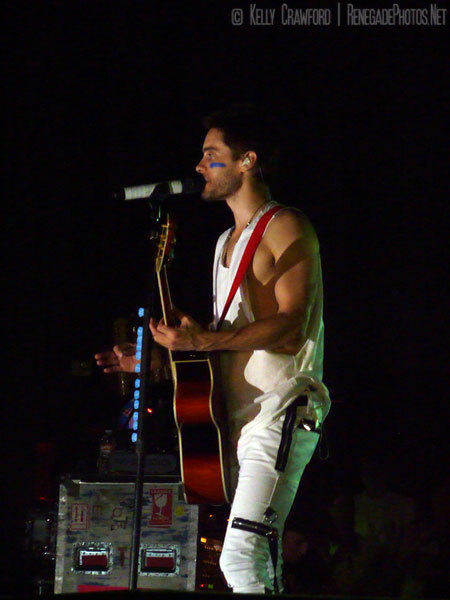 When 30 SECONDS TO MARS came out the crowd went wild. Jared Leto really made the crowd feel like a big family with lots of interaction, asking who had seen them before, who remembered back when they played the Gypsy Tea Room, and really getting on to a few people who weren’t on their feet. With a set list that started with “Escape” and included “Attack”, “This Is War”, and “100 Suns” the audience had plenty of chances to sing along – with Leto commenting about how well Dallas could sing. Add in an acoustic break with “From Yesterday”, “Too Late Tonight” and “Hurricane” was a nice touch and as always people from the crowd were brought onto the stage for the encore of “Kinds and Queens”. It was a great show and it all happens again tonight at House of Blues. Will this one be better than the last? Stay tuned and I’ll let you know!